Are blue Christmas lights your favorite? Planning to transition from traditional lights to LED? These pre-wired blue LED light strings are a quick and easy solution for your blue themed Christmas tree or next baby shower. We carry a wide variety of lens shapes from small wide angle (5mm) lenses to the largest C9 shape. Spacing between the lenses varies from 4 to 12 inches with all strings of lights constructed with 50 lights to the string. The wide angle, mini ice, C6, round and other similarly sized LED mini lights are most often used on trees and smaller projects. The C7 and C9 lights strings are also used on Christmas trees but find heavy use outlining buildings and landscaping. Tailor the size you choose to the size of your project. Mixing the shapes is a great way to add texture and interest. Do these strings have standard plugs? Yes, each string of lights has a male and female end plug and can be connected in series to the maximum specification for the string you are considering. Be sure to check specifications for the top number of strings that can be run in series as it varies with design. These lights are rated for indoor and outdoor operations. If you are asking if these lights can be submerged, as with most all electrical appliances, the answer is NO. They are designed to be water resistant but are susceptible to damage due to over-exposure to water, mud and extreme sunlight. 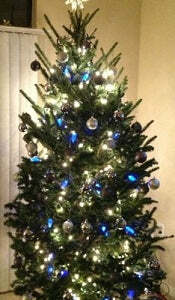 Christmas trees decorated with blue color LED mini lights and silver ornaments are elegant and classy. Combine your blue LED lights with red and white LED lights and youÄ�€â„¢ll have a patriotic Christmas tree. Add American flags and red, white, and blue bulbs and your tree will be stunning. Blue color LED lights with our C6, C7, or C9 bulbs instantly bring a festive and wintry appeal to the outside of your home. Shrubs, trees, tree trunks, barns, the eaves of the house, and fences decorated with blue color LED Christmas lights will sparkle beautifully. Just imagine blue color LED lights shimmering against a new blanket of freshly fallen snow! Any day of the year is a great day to show your patriotism, but Memorial Day and the 4th of July are usually popular times of the year for decorating with our countryÄ�€â„¢s colors of red, white, and blue. Our blue color LED mini lights, Razzberry LED lights, or Strawberry LED lights are ideal for adding pizzazz to your outdoor picnic or cookout. Use the three colors of LED lights to create a light arbor over your picnic tables, suspending them between fences or on the ceiling of your patio awning. Do you have a great wraparound porch? Drape your porch roof and banisters with red, white, and blue bunting and then swag your blue color LED lights along the outlines of the bunting for a patriotic look both during the daylight hours and at night. Consider using our blue color LED Christmas lights in your home theatre, game room, or fitness room. Outlining the ceiling, television screen, or large mirrors will bring a bit of light and color to the space. Trade show booths are another great place to use blue color LED mini lights. Typically, you have a back wall to the booth and a table or some sort of display in front of the booth area. Use the mini lights to outline the wall, accent your products, or bring attention to your booth. Lights will help your booth to stand out from the rest. Restaurants can use blue color LED Christmas lights during the holidays, but all year round as well. Outdoor seating areas look wonderfully inviting when decorated with LED mini lights. Restaurants with banquet rooms available would have something extra special to offer their guests by decorating with blue color LED lights for special events such as 4th of July parties, Presidential election celebration parties, birthday parties, or any other special occasion that might call for blue color LED lights. Outdoor festivals, barn dances, fairs, and square dances are all great backdrops for using blue color LED Christmas lights year round as well. Really, the Ä�€ï¿½blueÄ�€Â¯ sky is the limit!